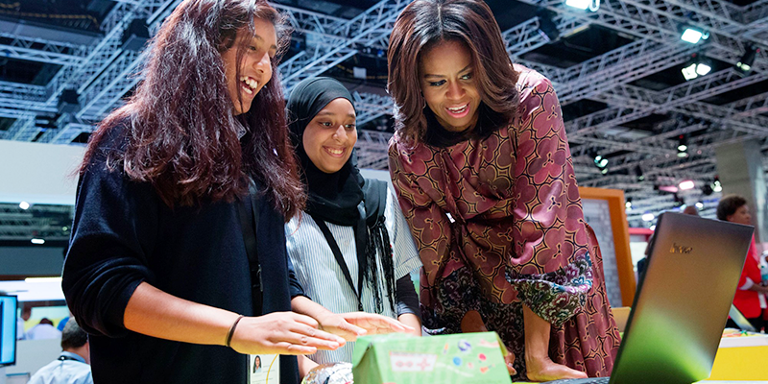 » Michelle Obama discovers the Ideas Box at the WISE ! The Ideas Box was exhibited for 2,000 participants coming from 120 different countries, including numerous specialists, experts, and key decision makers in the education field. Among the guests, we had the honor of hosting the First Lady of the United States, Michelle Obama. At WISE to promote girls’ education around the world, she stopped by for a visit of the Ideas Box and had the opportunity to talk and take pictures with a group of students who participated in activities organized inside as well as with LWB staff. Over three days, around sixty Indian and Qatari students aged 11 to 13 learned the basics of code with workshops set up by the Code Travelers (les Voyageurs du Code), a program of initiation to computer programming pushed by LWB in France, and with other activities held in the Ideas Box. WISE was also an important opportunity to meet other participants and potential partners.